The definition of women’s empowerment is very complex in contexts community development. 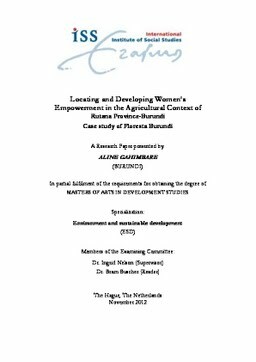 The objective of my research is to analyze the role of the NGO Floresta Burundi in its programs of empowering vulnerable populations (particularly women) in the rural agricultural context in Rutana Province, Burundi. Using a women’s empowerment approach, this research investigates how women’s empowerment is understood and practiced on the ground in a post-conflict context. I interviewed twenty-seven key actors involved in women’s empowerment programs (particularly in the area of micro-finance for agricultural support). My main interview findings show that the notion of women’s empowerment must include the question of inheritance of daughters as same as the sons in Burundian culture in attempt to have power to own land and credit. Relevance to Development Studies My research design has illustrated gender analytical frameworks. Floresta Burundi situated in Burundi is a significant case study because of its mixture of beneficiaries of its services. Community members who benefit from its services include repatriated refugees, returnees and those who stay in the country (the host). The country is in the post-conflict (and at times an ongoing conflict) context, with multiple socio-economic challenges. Floresta Burundi implements its work in a holistic manner, interconnecting agriculture and environment, savings and loans and spiritual development/reconciliation. The Burundian economy is essentially based on rural agriculture with 90% of the population working in this sector. Women, in this instance, have a vital impact in community development because of their profound role in local community survival mechanisms. This study is an attempt to understand the relationship between women, environment, agriculture and economic opportunities for poverty reduction.